Being able to spot what’s hot and what’s not is key to staying at the forefront of analysts’ sales recommendations. That’s why we are pleased to announce the Influencer Quadrant. It is a service that identifies which companies’ profiles are on the rise, and which companies are on the decline, in the world of industry analyst research. From celebrating analyst relation triumphs at firms whose profile has rocketed, or documenting slips in a company’s status, we’ve looked to make the Influencer Quadrant an easy-to-use tool. Anyone involved in analyst relations can use it to get ahead and develop successful influencer marketing programmes. In this industry, vendors’ share of voice in analyst research is strongly correlated with personal recommendations and mentions in research – both of which help generate business leads. How does the Influencer Quadrant work? 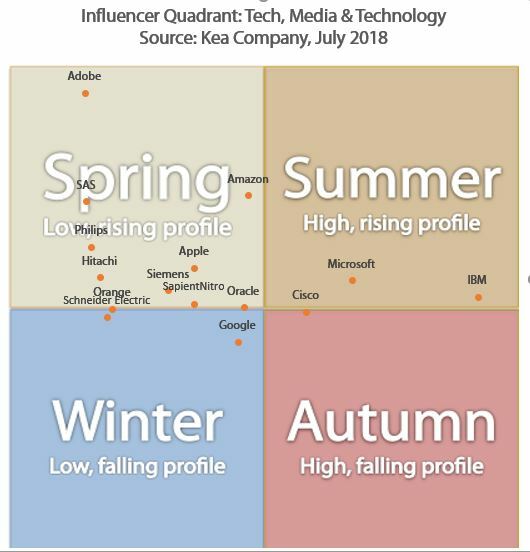 Put simply an Influencer Quadrant places firms from a particular industry into one of four segments: Spring (low profile, rising); Summer (High profile, rising); Autumn (High profile, falling) and Winter (Low profile, falling). By doing so the Influence Quadrant maps out those firms doing well, those with potential and those in decline against one another. It clearly identifies who’s on the way to the top and who’s on the slide down. Currently, we are offering subscribing clients Influencer Quadrants that span the following three major segments. So why is a tool like the Influencer Quadrant needed and who’s going to benefit? Well, it really boils down to the fact that AR is increasingly about the visibility connected to tracking metrics associated to influencers’ impact on purchasing behaviour. Even high-tech PR firms and investor relations experts are interested in gaining insight and seeing trends in analyst research since they anticipate trends in media and investor awareness. The share of voice reflects the frequency with which companies are mentioned in the research. Research is often shared and mentioned in social media, and so online influencers are often amplifiers for analyst research. As a result, fewer mentions in analyst research also produce a smaller ‘signal’ to be ‘amplified’ through sharing and conversation in social media. Because of its clear, metrics-based approach, the Influencer Quadrant is also an asset for those trying to tie industry analyst relations into public relations programmes and direct marketing. The high-tech influence model shows that analyst research is a powerful input into their activities. Because analyst research is widely cited in the media (and in media releases) is also used for content marketing and lead generation campaigns. As a result, a wide range of marketing influencers is being shifted by how marketing and PR firms. Increasingly a whole of advertising and marketing promotion programmes also use analyst research. In particular, that is because research that mentions specific vendors is used in order to change buying decision behaviour. If you want to know if your firm is sitting pretty or needs to pull its socks up when it comes to influencing the market then think of giving the Influencer Quadrant a whirl. You can see where you stand and what steps need to be taken to stay at the top of the chart. To get your hands on each new Influencer Quadrant, or one in particular, please contact us. This entry was posted in 4. Align, track & educate, 6. Features, Prioritize. Bookmark the permalink.